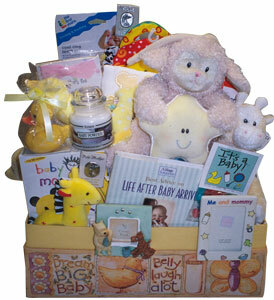 Perfect for a baby shower or newborn. A wonderful assortment of baby products and gifts, including plush toys, beanie baby, bath toys, bib, rattle, teether, baby outfits, Whoozit® toy, "Taggies" baby blanket, assortment of books including "Baby Einstein", Dr. Seuss "Are You My Mother? ", "Touch & Feel Puppy", "Touch & Feel Baby Animals", "The Cheerios Playbook", and Lamaze soft playbooks, some of our favorite books for Mom and Dad including "101 Secrets a Cool Mom Knows", "101 Secrets a Cool Dad Knows", "Little Things Long Remembered", "Parenting Survival Handbook", "12 Gifts of Birth", "Diaper Diaries", assortment of picture frames, brag book, My First Cookies designer cookies, My First Pasta , and much more! Choice of plastic toy truck, stork gift box, baby carriage gift box, duck gift box, decorative keepsake box, or Radio Flyer® wagon. Specify Boy or Girl (or Generic).